This beautiful architectural landscape was painted by the talented A. Gaiduk from the village of Fedoskino. Composition is shows one of the best Baroque architectural ensembles of Saint Petersburg, the Smolny Cathedral. It is situated on the bank of the River Neva on that very place where under Peter the Great there was a tar yard (Smolyanoy Dvor, as "Smolny" is Russian word for tar) that supplied the Admiralty with resin for the shipbuilding. After few years the tar yard was abolished but the place-name stayed. According to the legends, the daughter of Peter the Great, Elisabeth dreamt of retiring from the world and taking the veil. But she didn't want to leave Saint Petersburg that was the beloved creation of her father, and ordered to erase a convent on the place of the former tar yard. Architect Rastrelli was entrusted to make a design and direct the construction works that were started in 1749. The dazzling blue and white Baroque-style cathedral became the center of the ensemble. The architect combined elements of Russian and European architecture perfectly and harmonically. The rich decor of the facades, abundant use of the gilt, splendid combination of blue walls and white modeling make the cathedral look festive and solemn. Rastrelli died in 1771 and didn't see the ensemble complete. The construction works were stopped at the end of the 18th century and renewed only in the 1830s when architect Stasov started cathedral interior decoration. The spacious hall was marbled, three splendid iconstands were placed, facetted crystal balustrade was constructed in front of the altar and the beautiful rostrum was decorated with the most refined wooden carving. Among the treasures of the cathedral that have preserved till nowadays one should mention icons by A. Venetsianov - Christ's Resurrection and Presentation of the Blessed Virgin. The Smolny Cathedral is the record breaker of the construction terms, as the building has the longest story of erection in the city. It took 87 years to build this famous building. The Smolny Cathedral was consecrated in 1835 as the cathedral of all the Russian education schools for the sake of Christ's Resurrection. The revolution of 1917 became an important milestone in the history of the cathedral. 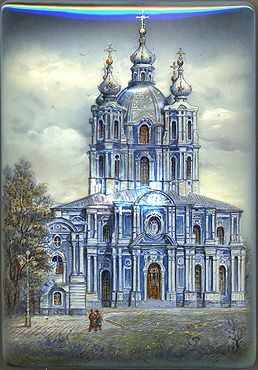 The Smolny Cathedral was plundered and the rich inner decorations were irreparably damaged. For quite a long period the Smolny Cathedral was blasphemously used as a storehouse. Today this magnificent building is used primarily as a concert hall and the surrounding convent houses various offices and government institutions. To paint this splendid scene the artist has used piece of mother-of pearl as inlay and bright blue tones of paint. The sides of the box are decorated with a gold and silver ornamentation also painted on these non-traditional colored sides. The box is constructed from paper-mache. White lacquer is used to paint the exterior and the interior of the box. The lid is hinged from the left of the composition, and the box rests flat. The box is signed with the artist's name and the title ("St.Petersburg").